Two weeks ago on Thursday, at the Howard Greenberg Gallery at 41 East 57th Street, there was a reception for an exhibition of the photographs of Judy Glickman Lauder. The exhibition, which runs through May 20th, Upon Reflection: Photographs by Judy Glickman Lauder, features the artist’s recent work, subtle and poetic self-portraits and abstractions in dreamlike settings and distilled urban landscapes. Over the past five years, Glickman Lauder has worked using only natural light to capture reflections and shadows that become abstractions often including self-portraits that are slightly hidden, some revealed only upon closer examination. The large prints are drenched in color, with intricate patterns and intriguing perspectives. The series represents a transition for the photographer: “My work in color has sent me in another direction — one of exploration and of introspection,” she notes. Glickman Lauder, whose career began in the 1970s, is best known for black-and-white images relating to the Holocaust over several decades, and the exhibition also includes a selection. 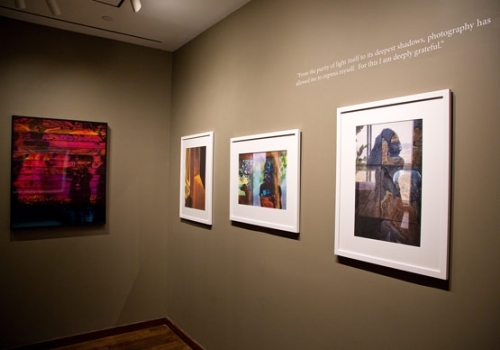 Her work from travels to Cuba in 2003 are also on view. Her photography, which has been exhibited extensively at more than 150 major museums and galleries, will be seen this fall in the Jewish Museum’s Masterpieces & Curiosities: Theresienstadt Bracelet exhibition. She is represented in more than 300 private collections nationally and internationally, including the Metropolitan Museum of Art, Whitney Museum of American Art; The Jewish Museum, New York; J. Paul Getty Museum, Los Angeles; Los Angeles Museum of the Holocaust; United States Holocaust Memorial Museum, Washington, D.C.; Denver Art Museum; Houston Museum of Fine Arts; and The Israel Museum, Jerusalem. Mrs. Lauder also serves on the Board of Trustees of the Portland Museum of Art and is a member of both the Getty Museum Photographs Council in Los Angeles and the Photographic Visiting Committee of the Metropolitan Museum of Art in New York City.